The integrated webserver of CamUniversal allows to control all cameras which are running in CamUniversal. The webserver sends the video pictures from all cameras by HTTP request. Additional the webserver allows to start an external program. To run the webserver you have to start the webserver in CamUniversal. If the webserver is running you could send HTTP commands to CamUniversal. These commands are interpreted by the webserver. For your convenience there are the following html sample documents included "cam_control.htm", "cam_view1.htm", "cam_view2.htm", "cam_view3.htm". These documents are using JAVA scripts to send the webserver commands to CamUniversal. Open the documents with your Internet browser and see how they work. Try "cam_control.htm" first, which supports to input direct the IP address of your PC. 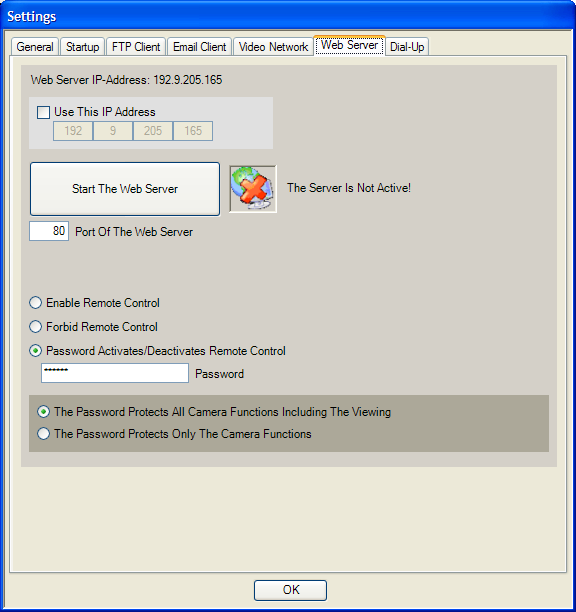 Insert the IP address and port, which are shown in CamUniversal (see above). You can open cam_control.htm on your local PC, from a different PC in your LAN or upload it to your ISP webspace and try it from the Internet (Live Camera Sample). More information about setting up the integrated webserver can be found in the CrazyPixels Forum here and in the First Steps! http://192.168.110.100:81/camera=1&quality=40 - then insert the quality of the received video picture. If you want to receive the camera pictures in short intervals it is better to select a low quality. http://192.168.110.100:81/camera=1&resolution=160x120&quality=40 - if you want, you can select the resolution of the received video picture. If you don't select a resolution, the picture has the resolution of the camera. You can control the camera from remote. Additional you can start all external programs which are available on your system. The camera number is ignored in this command! After "execute" insert the path to the program on your system.